Scroll to the end of this post to grab a special 10% discount code to use at Sticker You! One of the greatest pleasures of my current existence is picking my kids up from school. This sounds kind of odd, because I’d actually rather leave my kids at school for the rest of their lives, and well, you’d think there would be plenty of other experiences that I’d enjoy more than simply picking up my kids from school, right? Let me explain. You all should, by now, know that I bake. I bake a lot. Sometimes I offload a bit of excess baking to my friends. I don’t have very many friends, but the ones I do have, I love and cherish. Some of those friends I meet at school pickup time at a special picnic bench while we wait for the home bell to ring and our children to rush out. We chat about anything at all in those 15-20 minutes. It’s a relaxing time (maybe we value it just that little bit more because it’s those last few minutes before all hell breaks loose our children come home). Sometimes we’ll bring a coffee. Sometimes we’ll bring along something we’ve baked that day. We even have our own special hashtag we share on Instagram and Facebook to let each other know we’ll be bringing something! The other moms walk past our special picnic bench on their way down to the school and look at us (probably wondering if we even go home after school dropoff) with envy (or at least I like to think it’s a look of envy) (because we’re so lovely and gorgeous and awesome) as we graciously devour our coffees and baked treats with smiles and laughter. They’ll stop at our bench sometimes and join in on the conversation and it is when this happens that word spreads about my little humble old blog. I’ve shared a few of my business blog cards while sitting at the school’s picnic bench. 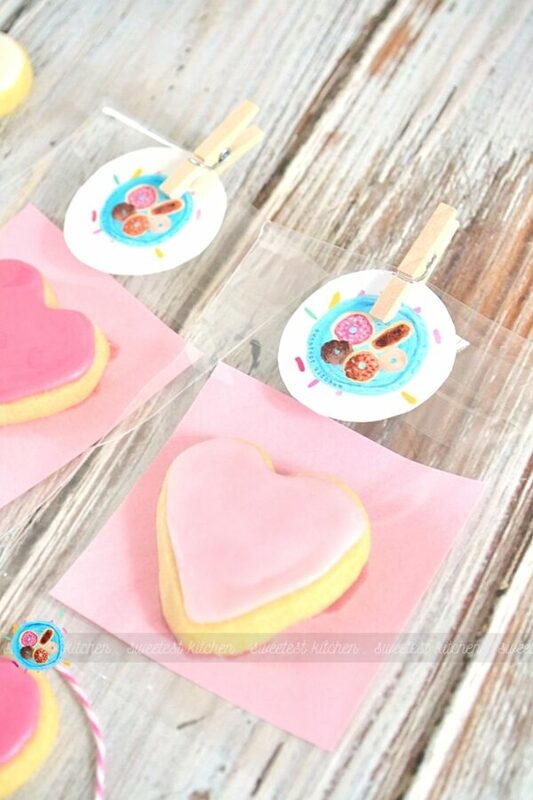 Yet, I’ve always wanted some custom stickers to stick onto the packaging I stuff my treats into (glassine paper bags, cellophane bags, little boxes, etc). 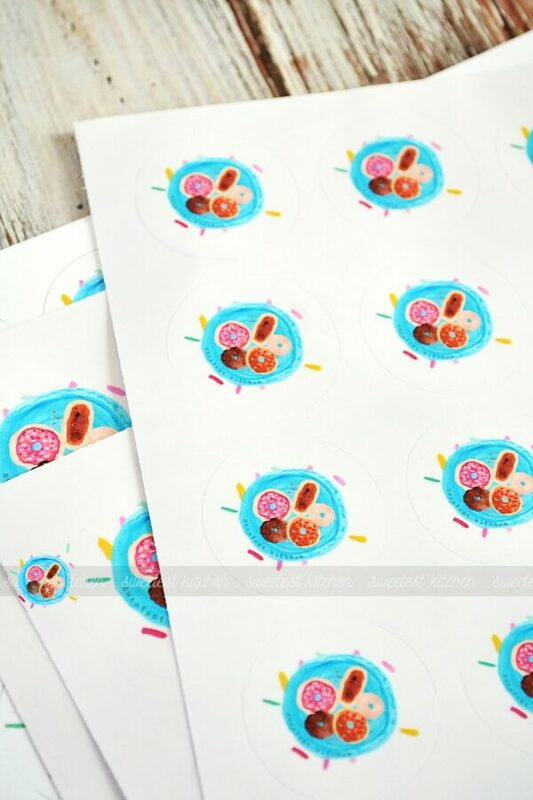 Of course, I do have a variety of little generic cupcake stickers I affix onto the packaging, and I do have an amazing label designed by my friend, Kristy, of Southern In-Law, but I’m currently almost out of those and they don’t have my blog logo on them. There are so many custom sticker companies out there that I often feel overwhelmed when I go to narrow down my choices. I usually just give up and plan to come back later. Then one day recently, out of the blue, I was contacted by a lovely lady from Sticker You, which is based in Canada, who asked if I’d like to try out their custom stickers (of course!). Somehow, I had not yet come across this website. Having a quick browse through the stickers on offer, I was impressed with the variety available – stickers for anything! Not only that, but labels for product packaging, temporary tattoos (imagine a Sweetest Kitchen temp tattoo – awesome! ), decals for walls and floors, iron-ons, magnets!! And all are easily customised! Wow!! I chose exactly what I had been wanting – just a simple blog logo sticker to attach to my packaging. While I was waiting for them to arrive, I was busy trying to think of what kind of little treats I could make to show off my new stickers. 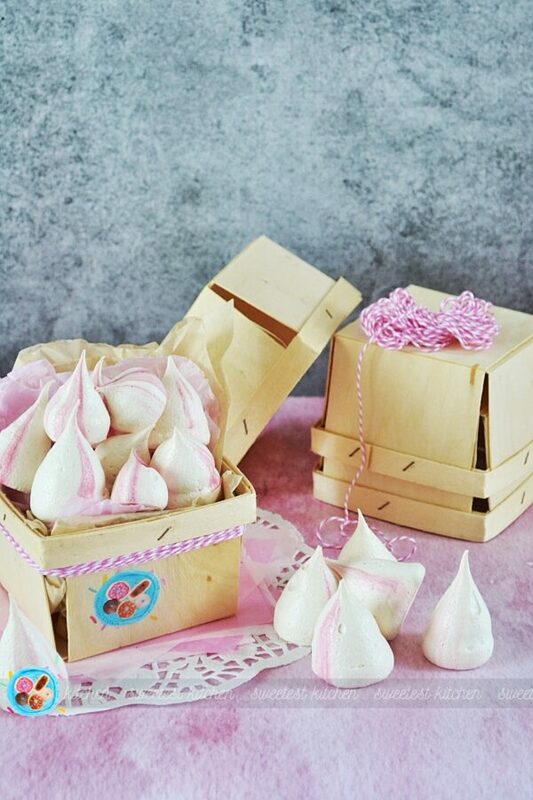 Meringues? Sugar cookies? Sounds good to me! Couldn’t choose between the two, so went with both! Haha! My stickers! 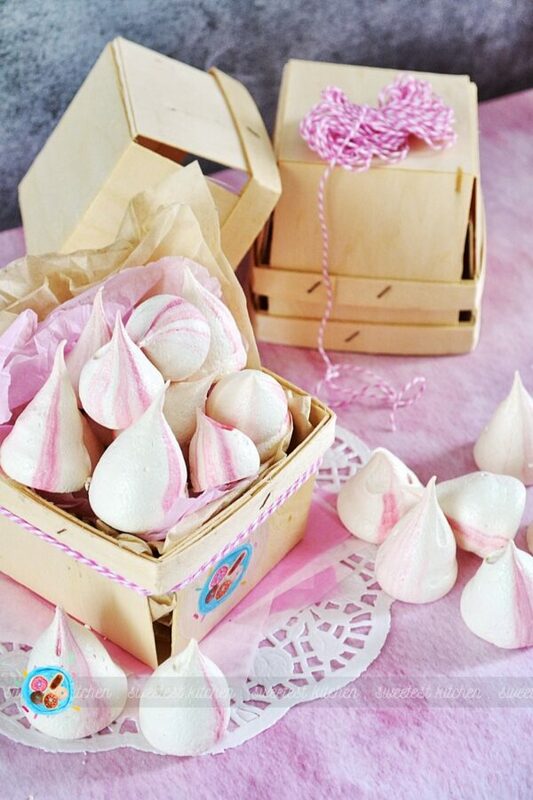 How cute do these look! They 100% match my blog cards and I am 100% happy with these cute little things! I received some sheets with a clear backing and smaller logo, and some sheets with a white backing and larger logo. The stickers are made from high quality vinyl and are durable, weather-resistant and waterproof. They stick on most surfaces and will not leave a yucky sticky residue behind when removed (we all hate that sticky residue that you can’t ever get off when you remove a sticker, am I right?). For my batch of sugar cookies, I used a basic sugar cookie recipe and soft-setting icing to top them. Once the icing was set, I slid a square of pink paper (obviously it wasn’t greaseproof!) into a clear cellophane bag and placed the cookie on top. After sealing the bag, I cut out some of my stickers (with the backing still on so they wouldn’t stick) and attached them to the bag with a mini clothes peg. I stuck some of the clear stickers straight onto the bag, but decided I liked the look of the round stickers held on with a peg better. Which, yes, I realize defeats the purpose of using stickers! Anyway, at school pickup that day, everyone thought the cellophane bags looked super cute and I had a little rave about how cool the stickers are! 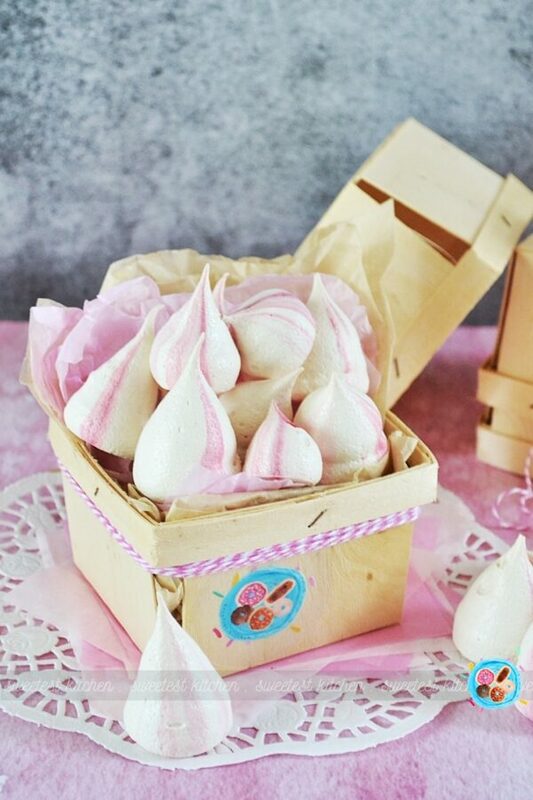 For my next play with the stickers, I used my wooden punnets and pink-stripey homemade meringues. Despite the rough, bumpy, wooden texture of the punnets, the stickers did indeed hold tight and looked adorable! Sticker You’s custom labels would also be great for food packaging such as this – you can add the name of the food and an ingredients list and then just whack that label on the front so everyone knows exactly what they’re eating. How professional would that look at the next bake sale!! In closing, if you’re after a special customised touch for your baked goods, other food products, or your business, I’d highly recommend Sticker You! 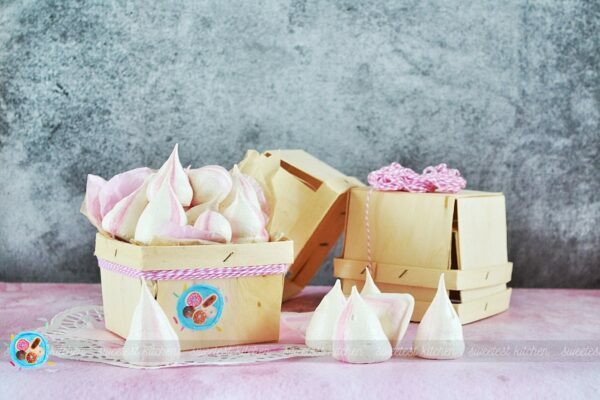 And great news – a special 10% discount code at Sticker You for Sweetest Kitchen readers! Just enter SK10OFF at checkout to receive 10% off your entire order. Offer expires end of February. 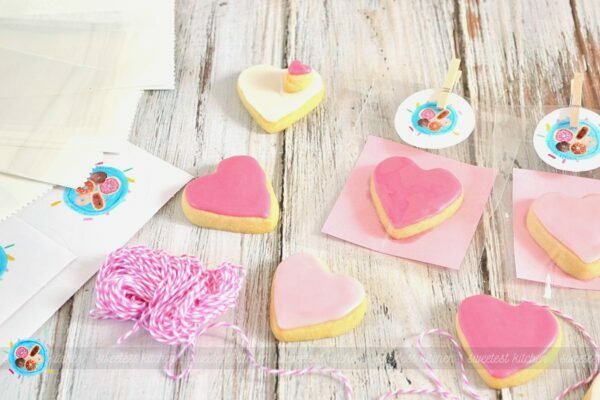 Really easy cut-out sugar cookies, great for any occasion! 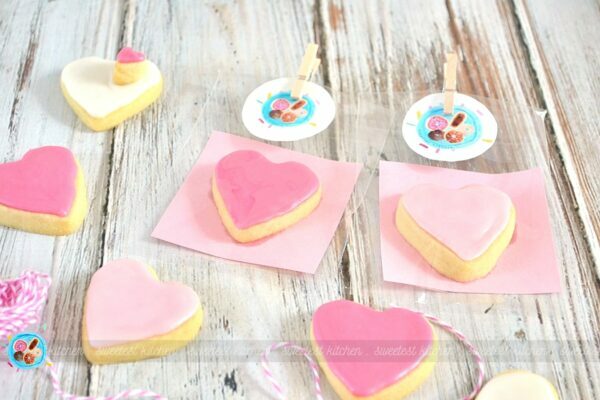 These cookies are soft, sweet and super delicious! For the cookies: Sift flour, baking powder and salt into a bowl and give it a little stir to combine. Set aside. Cream butter and sugar together with an electric mixer until light and fluffy. Add egg and vanilla and mix until smooth. Slowly add the flour mixture to the butter mixture and mix just until combined. Note, if the dough is still too sticky, add another ¼-1/3 cup flour until no longer sticky. Transfer dough to a lightly floured surface, knead briefly to bring it all together. Flatten dough into a disc, wrap in plastic wrap and chill for at least 2 hours. When dough is chilled, preheat oven to 325F (170C). Line a baking tray with baking paper. Roll the dough out on a lightly floured surface to ¼-inch thick. 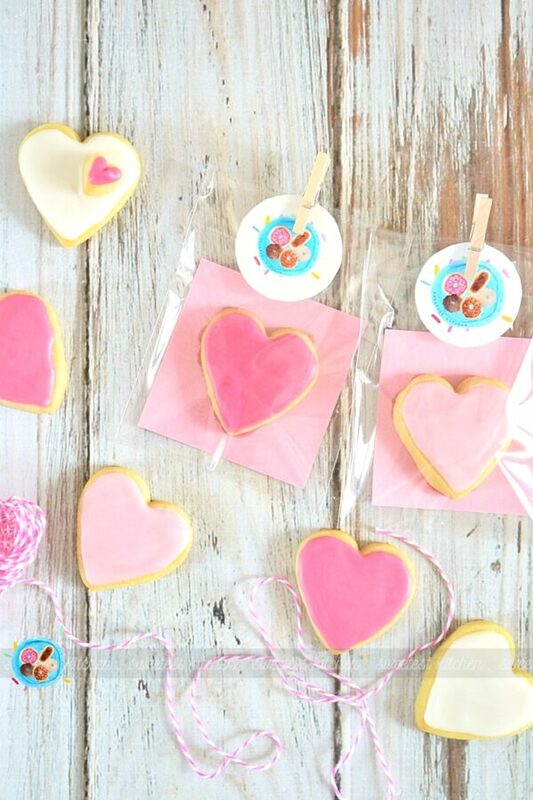 Use your cookie cutter of choice to cut out shapes from the dough, dipping the cutter into some flour after each cut. Re-roll the dough as necessary. Place cookies on prepared tray and bake 6-10 minutes, depending on the size of your cookies (smaller cookies need less time, larger cookies need more time). Remove from the oven when the edges of the cookies are just starting to brown. Cool on tray for 5 minutes, then transfer to a wire rack to cool completely. For the icing: Sift icing sugar into a bowl. Add butter, vanilla extract and sufficient boiling water to mix to a spreadable/pipeable consistency. For different icing colours, divide the white icing in separate bowls, then add one drop at a time of red colouring to icing to get shades of colouring, light pink to dark red. I piped the icing onto the cookies, using a small round tip. I traced around the edge of the cookie first, then filled it in. Feel free to make designs, or simply spread it on. Allow the icing to set 30-60 minutes. Note that this icing does not set hard. Depending on how large your cookies are, and how much icing you'd like to put on the cookies, you may need to make double the amount of icing.